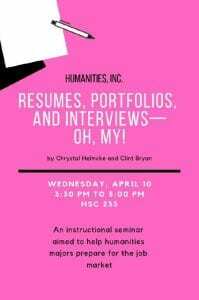 The new seminar series, Humanities, Inc., begins with its first session this Wednesday, April 10, 3:30-5 pm, to discuss how students can prepare themselves for entering the job market. The first seminar, “Resumes, Portfolios and Interviews—Oh, My!” will be led by Professor Chrystal Helmcke and Dr. Clint Bryan, and will address the necessary steps in approaching jobs as a college graduate. The seminar will be open to all students. The idea for this seminar series came from Professor Lenae Nofziger, Helmcke, and Bryan, in hopes of offering positive and realistic ways for students in the humanities to approach their post-graduation careers. It will be a platform for NU faculty and speakers to address general job market concerns of students, who might not be able to get all the answers from a classroom setting. As the seminar name implies, there will be a focus on the humanities department to offer advice and tips on how to utilize communication, research, and creative thinking skills in the job market. Nofziger explained that the series will be helpful for students who are tasked with the job of effectively presenting their skills to potential employers. Humanities, Inc., will provide students with the opportunity to find out how they can wield their knowledge and skills in the job market, and thus alleviate some post-collegiate stress. The Humanities, Inc. seminar series is set to take place four times during each school year, twice a semester. Future sessions will include topics like successful internships and grad school prep, among others.